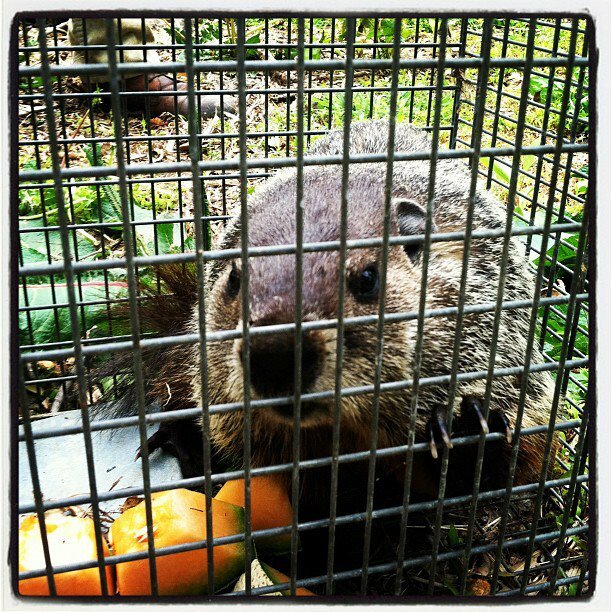 Well, after unwittingly catching a squirrel and making a trip to the market for a cantaloupe, I got him. Poor guy. He was so scared. I just have to keep reminding myself that he and I are simply competing for resources, and my half acre can't sustain us both. I told myself that he is way more adaptable than I, and that he should get along just fine in his new habitat. I also told myself that he is a he, lest I start worrying about unfed babies waiting for their mother back in the hole (thanks, Amber). So he's off on a new adventure in Fairmount Park. Across the great Schuylkill River. The next order of business will be getting that wood pile cut up and stacked elsewhere. That'll do the trick I'm sure.